Billing meet fees is a two step process. Invoice and charge meet fees. 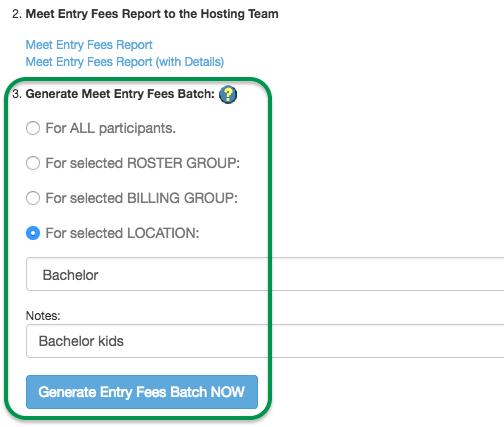 This article covers step 1a, where any admin can either generate a meet fees batch or a meet fees report to submit to the meet host. Click Edit Commitment below the desired meet. Click Generate Entry Files in the Export section. If you want to generate a meet entry fees report so you can submit it to the meet host, click the desired link under section 2. You may skip the rest of the steps. In section 3, Generate Meet Entry Fees Batch, if you want to generate the fees for only one Roster Group, Billing Group or Location, select the appropriate option and then select from the dropdown that appears. Note: If section 3 looks different, you must activate Generate Meet Fees v2 (Billing Admin > Billing Setup > check Generate meet entry fees on entry file generation, click Save Changes). You may enter Notes that will be saved with the batch and only visible to Super User and full access Financial Admins who will process the batch. For example, if you will generate fees only for a certain location, type Bachelor kids, for example. Click Generate Entry Fees Batch NOW and OK to confirm. This will generate a fees batch and display it on the Meet Entry Fees screen. Here you can review all the entries to make sure they are accurate and complete. If not, you can go back to Committed Athletes and make any needed corrections, then generate another batch. This will also email the Billing Administrator (defined in Billing Admin > Billing Setup) the following: "A new meet entry fee batch has been generated for your team. Please click the below link to review the batch and create invoices/charge credit cards." Clicking the link will take them directly to the screen above, where they can generate invoices and charge meet fees. The Billing Administrator will need to be a Super User or full access Financial Admin for the link to work. 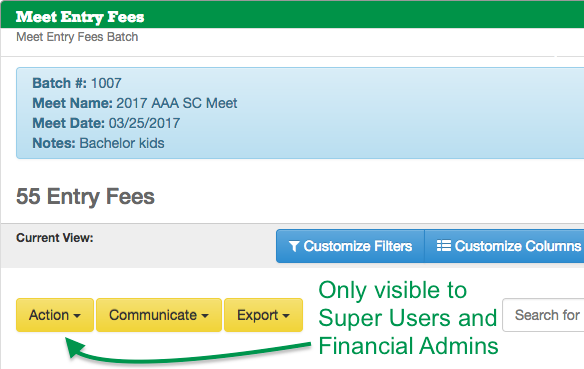 Super Users and full access Financial Admins can directly generate invoices and charge meet fees from here using the Action button. Email/Print/Calendar and Webmaster admins will not see that button, but they will see the Communicate and Export buttons.